The Questrom School of Business bustled with activity the morning of Jan. 31 as a daylong Ideathon began. Participants spent their time brainstorming, analyzing and reflecting on issues and solutions around gender pay gaps. thon.” The ideathon focused on cultivating ideas on how to close the wage gap with innovative privacy technology. The BWWC is a collaboration between Boston Mayor Martin Walsh and the Greater Boston business community. The BWWC office is located in BU’s Rafik B. Hariri Institute for Computing and Computational Science and Engineering. “BU is really the home for the council. Without the technology and technical assistance, this wouldn’t exist,” said Tania Del Rio, executive director of the Mayor’s Office of Women’s Advancement. 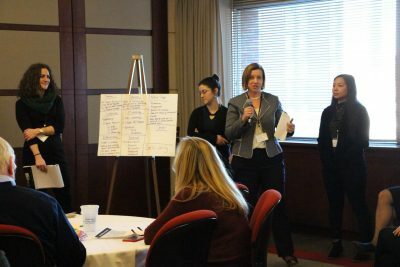 The Q1 Briefing and Ideathon was the first Ideathon that the BWWC had hosted, and it also served as the first quarterly briefing of the year for the BWWC’s 100% Talent: The Boston Women’s Compact. Boston University signed the 100% Talent Compact back in 2017, joining more than 235 businesses that are also in the compact. BU and the various companies share their data on employee demographics and salaries in a quarterly briefing. The compact aims to “make Greater Boston the premier place for working women in America, by closing the wage gap and removing the visible and invisible barriers to women’s advancement,” according to its website. Participants were divided into teams and worked together to create applications and technologies that solve gender inequality in the workplace and help track individuals’ advancements. Shereen Shermak, executive director of the Boston Women’s Workforce Council, said the event’s organizers invited participants over Facebook and Twitter to join in during the Ideathon. “We have a list of compact signers, and they are always invited and welcome, but for this event, in particular, we cast a very wide net,” Shermak said. In addition to the participants, a group of business professionals were selected to sit on a panel to judge the work of each team and choose the most innovative and creative idea. The panel consisted of people who had experience giving feedback on the early stages of these kinds of projects, according to Shermak. Del Rio emphasized that anyone can come up with a good idea. Multiple teams focused on how transparency and advancement could become more accessible, Shermak said. With the first quarterly briefing of 2019 over, the BWWC said they are looking forward to the year to come and to continuing to recognize the companies that are compact signers.